When kids go through shoes SO quickly, it's important to get the ones will last and last until their feet reach the next size. 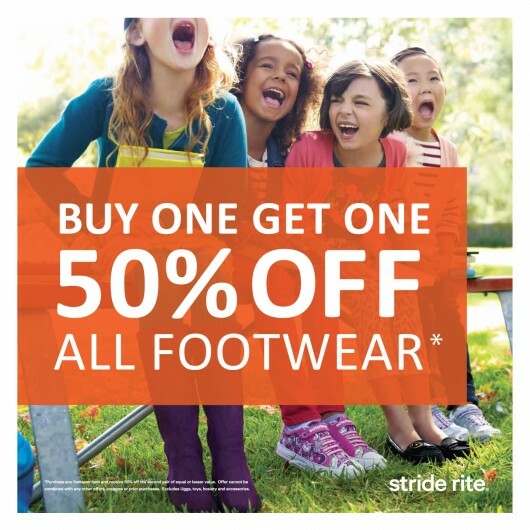 Right now you can Stride-Rite (one of our favorite kids brands!) is offering Buy One Get One 50% Off ALL FOOTWEAR. This deal is good online, in-stores and at the outlets. When shopping online enter code SRBOGO. This deal is good through November 14th only, so if you're in need of shoes before the holidays don't miss out! Shipping is FREE on orders of $75+. Standard shipping on all other orders is $4.99.